I keep myself concentrated extremely, run through and it's almost complete. My family, friends and unseen friends, this is my faith, my fear and my work. This is what I ought to do. "In current education of art, everybody sets worth on "how to handle the work or how to achieve output" then there's nobody doubt it. But the truth is "what to input" is worth more than such technology theories. It is impossible to achieve high quality output without high quality input. To be keen on higher quality input, that's all what we need. " As it shown his words, JINMO always consciously being active, aggressive and keen on input beautiful things to himself. However, just a month ago, the incredible disasters struck Japan and it also effected intensely to JINMO as an input of the realistic hell. 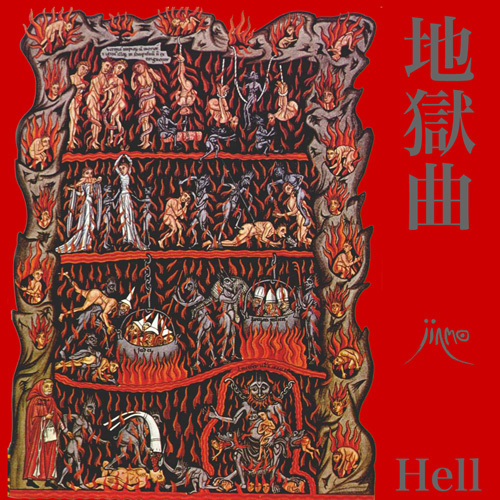 This album "Hell" is inevitable output from JINMO as a result of input of hell. And it is exactly as hell is. Not as the symbolised music but as the music influence on human emotion actualy, "Jubilus: RGB Trilogy of lights" is still fresh in our memory. The Jubilus trilogy might be clusters of energy with a strong directivity to "Jubilus". And this album "Hell" is holding strong energy as much as Jubilus series, its direction is towards the opposite, the hell. The painting on the cover is a scene in Hell drawn by Herrad von Landsberg (Herurato of Landsberg 1130 - 1195) the abbess of Alsace, it had drawn around 1180 for illuminated encyclopedia "HORTUS DELICIARUM (Garden of delight)". The universal fear of Hell, it is really beautiful but fearful for us live in 830 years later. JINMO stared at this painting often while he was composing "Hell". That's the reason why the impression both of this painting and the sound of hell are really close. Yes, it is beautiful but fearful. Large numbers of voices pan on various periods and move, it is the one of the important elements in this album. So we recommend listening with headphones for the higher listening experience.